Beef feedlot managers, owners, employees and supporting industry personnel attended presentations in February 2014 for the latest in feedlot health, nutrition, environment and economics. The Roundtables were offered in Nebraska with 6 remote links to sites in Iowa with Iowa State University Extension. Selected topics and speakers were recorded as webinars for those that were unable to attend. NOTE: All webinar recording links will open a new window or tab, depending on your browser setting. In the past Nebraska limited mortality composting to carcasses weighing less than 600 lbs, but this restriction has been removed from the state statute, opening the door to a new carcass disposal option for beef cattle and other large livestock. Although Nebraska has maintained a size restriction on mortality composting for many years, other states have successfully demonstrated that large carcasses, including beef cattle, dairy cattle, and horses, can be effectively composted. Amy Schmidt walks producers through components needed to develop this system in their operation. During the 2014 Feedlot Roundtable, Dr. Dustin Loy with the UNL Veterinary Diagnostic Center shared with producers developments relating to Bovine Respiratory Disease (more commonly known as BRD). In this recorded webinar, Dr. Loy identifies the common bacteria isolated from cases submitted to the diagnostic lab, reviews common antimicrobials used to treat BRD and resistance mechanisms. FDA eliminates antibiotic use for growth promotion and efficiency: what does this mean for producers? Dee Griffin discusses the FDA's December 2013 feed antibiotic control announcement to cattle producers. This is the final step in a series of events that started almost 20 years ago. The FDA received input from the Center for Disease Control on concerns about antibiotic resistance in animal agriculture and the potential relationship with resistance to antibiotics for human treatment. In this recorded webinar, Dr. Griffin walks through the changes that will be implemented and the challenges and opportunities cattlemen will have with these new regulations. Third party audits are not new to cattlemen but this topic has regained interest because consumers want to know how and where their beef is raised. Rob Eirich identifies what information is being requested and how this will help to improve product integrity and consumer confidence. In this recorded webinar, Rob identifies several key elements included in a 3rd party audit. Producers have access to the tools needed to prepare for 3rd party audits using Beef Quality Assurance Assessment (BQA) worksheets available on the Beef Quality Assurance website. Feedlot closeouts were evaluated to determine how animal performance changes throughout the finishing period on a live- and carcass-weight basis. Some cattle feeders have the paradigm that when feed costs are high and profit margins are negative it is more profitable to market cattle early. This is often true when selling on a live-weight basis to protect investments. However, many producers sell on a carcass basis and the data suggest selling early may not be beneficial. 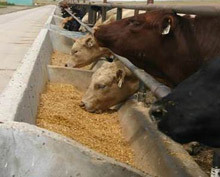 Optimal profitability may be achieved by feeding steers longer when selling on a carcass basis because the transfer of gain to the carcass is improved throughout the finishing period. View this recorded webinar to see more of these data presented by Jim MacDonald. New technologies are available in the ethanol industry allowing the conversion of cellulose to ethanol as an advanced biofuel. Currently new cellulosic ethanol plants are being constructed to use fiber many cattlemen rely on as a feedstuff. Future expansion of cellulosic ethanol includes using the fiber component of distiller grains which will change the nutrient composition of the byproduct and also how it is used in beef diets. In this recorded webinar, Dr. Galen Erickson discusses how fiber is our #1 need for energy during the lifetime of most cattle.